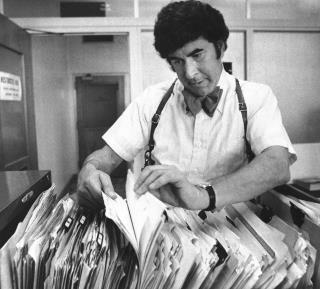 (Newser) – Dave Toschi, the San Francisco police detective who led the unsuccessful investigation into the Zodiac serial killer a half-century ago, died Saturday after a lengthy illness. He was 86. Toschi was put on the Zodiac case after a San Francisco taxi driver was shot to death in 1969. He was removed nine years later when he acknowledged writing and mailing anonymous fan letters to San Francisco Chronicle writer Armistead Maupin lauding his own work, reports the AP. Five people were fatally stabbed or shot to death in Northern California in 1968 and 1969, and their killer sent taunting letters and cryptograms to the police and newspapers. The killer was never caught. He was dubbed the Zodiac killer because some of his cryptograms included astrological symbols and references. Toschi was born in San Francisco and served in the Korean War with the Army. He returned to San Francisco in 1953 and was hired at the Police Department, where he worked until retiring in 1985. Duffy Jennings covered the killings for the Chronicle and grew close to Toschi. Jennings said Toschi visited the San Francisco murder scene on the anniversary of the killing for many years in a row to see if he overlooked any clues. "The Zodiac case gnawed at him," Jennings said. "He said it gave him an ulcer." Actor Mark Ruffalo portrayed Toschi in the 2011 movie Zodiac. The Chronicle notes Toschi was a "snappy" dresser with a "penchant for bow ties," a look that is said to have inspired Clint Eastwood and Steve McQueen's characters in Dirty Harry and Bullitt, respectively. i remember once reading he was the real life Dirty Harry (must've traded his Magnum for an ugly tie). The letter was meant to throw off the investigation. To confuse the police, make them spend untold resources on experts and research. Evidently it went to full plan. Criminals have a reputation for being stupid because cops are so stupid, they can only catch the stupid ones.